As the Harlem Shake craze began to take shape in February 2013, a colleague of mine, Jack Lyttle, and I pitched the idea of a Columbus Blue Jackets Harlem Shake to the Director of Event Presentation, Derek Dawley. He gave it the green light. Derek gathered his production crew, promotions team members, and some props, while Jack and I rounded up the staff participants and additional props. Throughout my nearly year-long experience with the Blue Jackets, I was able to propose and enact a handful of social posts. Each post's purpose was to promote campaigns or events. You can view the posts, a brief description, and their numbers below. 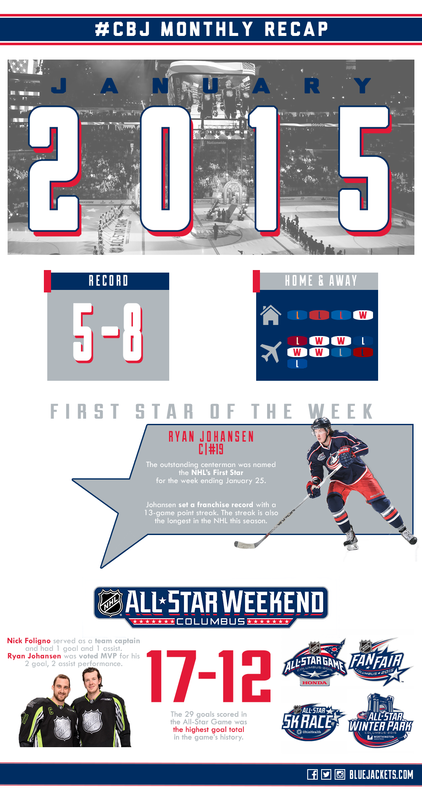 This graphic was posted to Facebook on May 23, 2013 to encourage the Blue Jackets faithful to vote for our goaltender Sergei Bobrovsky (the #4 seed) in the semi-final of the EA SPORTS NHL14 cover vote in which he faced #1 seed John Tavares of the NY Islanders. Received 708 likes and 382 shares by our Facebook fans. This short was created on May 30, 2013 to remind fans to vote for Blue Jackets goaltender Sergei Bobrovsky in the final of the EA SPORTS NHL14 cover vote using the hashtag "#NHL14Bobrovsky" on Twitter. Garnered 158 likes on Vine, 126 retweets and 20 favorites on Twitter. NOTE: The "Bob"s heard throughout were to emulate the "Ba"s from "Barbara Ann" by The Beach Boys; various shot locations made it difficult to maintain the appropriate pitch of the song. This short was created to promote our Front Street Friday event (#CBJFSF) on June 14th, 2013. 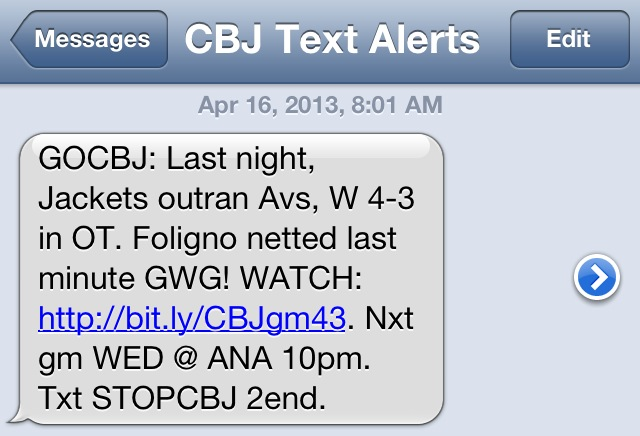 CBJ Text Alerts was my first responsibility during the fellowship. It was a new program that the Digital Marketing department initiated over the summer of 2012. 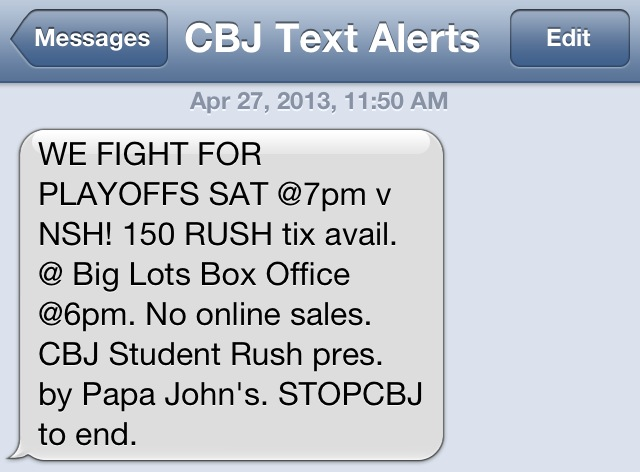 The goal was to increase the subscriber lists of GoCBJ alerts (scores, news) and CBJRush alerts (student ticket offers and promotions) to create a more engaged audience. We created two large campaigns that were promoted during events and games in effort to gain subscribers. With the NHL lockout, the platform took a big blow to its numbers. Throughout the season, we tried various measures including promotional spots during games, tying in giveaways, and integrating it into social media. A chart of how we responded to the blow of the NHL lockout. I served as the Digital Marketing Fellow during the 2012-13 NHL season with the Columbus Blue Jackets organization. My responsibilities included compiling compelling content for our weekly "Flag Bearer" newsletter, managing over 20 text alert campaigns, serving as the customer service representative for purchasers of VIP Experience packages, and creating, editing, and maintaining numerous pages on BlueJackets.com. During Ohio State's Freshmen Orientation on August 19, 2012, we created a contest for various items. 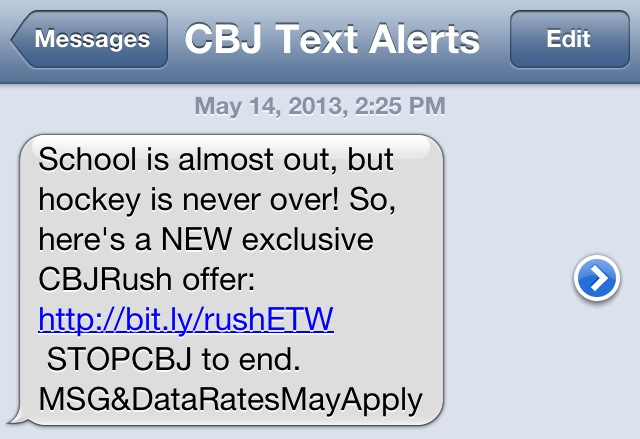 Students had to text in to win and were asked to join the CBJRush list. During the season, we utilized Twitter to promote this alert program for students. This chart shows the growth of the list. 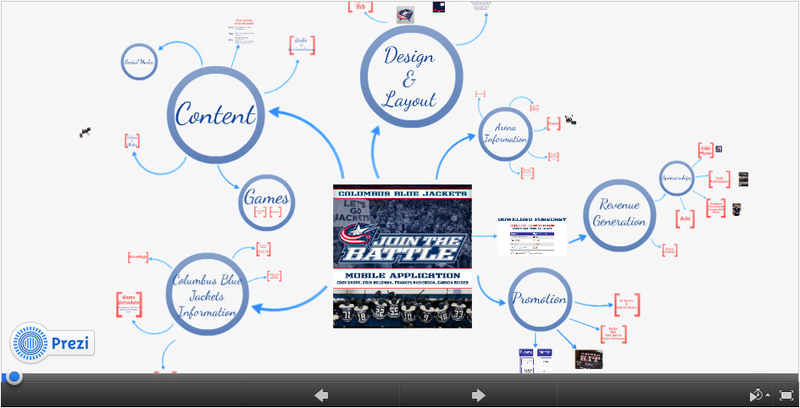 Through June and July of 2013, I led a group of interns in creating a content and marketing strategy for a Columbus Blue Jackets mobile application. Our focus was to answer two questions: “Why will fans download our app?” and “How we will promote the app?” Content, design, revenue generation, download forecasts, and promotion avenues were discussed. On July 8, 2013, we presented our ideas to the organization's front office. You can view the presentation below. Our team strove to position content in an compelling way so the recipient follows the story preview to our website. Here are four examples of how we varied our email layout for user engagement. 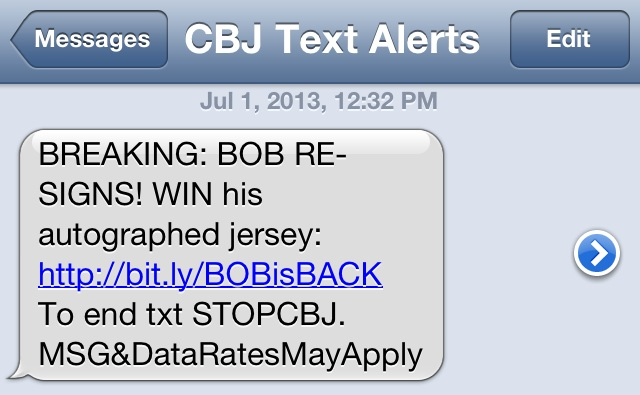 June 20, 2013: "Bob Wins! | See the Vezina at our Draft Party!" June 28, 2013: "What is Jarmo's Draft Strategy?" July 12, 2013: "Which Prospects Impressed at Development Camp?" July 19, 2013: "BREAKING: 2013-14 Schedule Announced!" Bob Wins! | See the Vezina at our Draft Party! 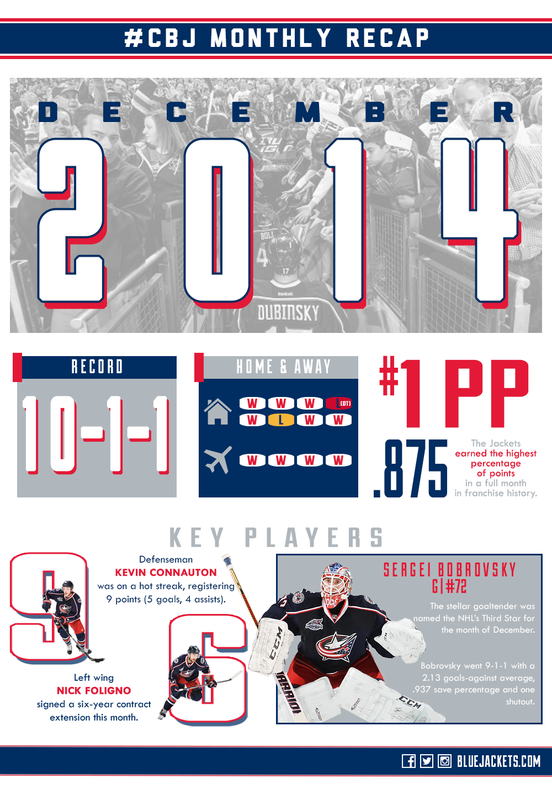 What is Jarmo's Draft Strategy? Which Prospects Impressed at Development Camp?